Total relaxation is always in the future or in the past. Either we aspire to it, dream of it, hope for it, or we fondly, maybe wistfully, reminisce about it. The reason for this elusiveness is probably that nagging list of things to do. The eagerness with which we bought those tiny little plants or seeds with idyllic thoughts of fat, red tomatoes still warm from the sun, perfect green beans or snow peas, glorious zucchini, visions of the endless, hot summer days, seems a distant memory when confronted with one burgeoning, insistent crop after another. If you've ever planted so much as one innocent cherry tomato, you know exactly what I mean. You dreamt of a bowl of green beans at the ready at the moment you needed a bowl of green beans. Instead, you are confronted with a truckload of beans at various stages of readiness. Indeed, if you turn away from a perfect bean even just to smell a rose, your bean has been transformed into a tough, woody creature unfit for human consumption. And remember thinking that one zucchini plant would surely not be enough? A zucchini will go from perfect to the size of a thigh in the blink of an eye! Now what to do? On a sunny day, those sweet little cherry tomatoes burst their skins faster than popcorn on a hot pan! You soon have to come to grips with the fact that your long hours of relaxation have been hijacked by your vegetation! Up early before the heat of the day to get a tub of water on the go for blanching. Then there's the harvesting, washing, trimming, blanching, ice bath, and freezing. Oh dear! The freezer is still full of last year's lovingly prepared crop. But there's no time to sort the freezer now! Vegetables are blowing up like puffer fish all over the garden! Surely friends would love to share in the plenty. Most of them, however, have plenty of their own and are likely as not to show up on your doorstep with a zucchini as big as a baby and a hopeful look in their eye that you will take it off their hands. Zucchinis are the "basket of kittens" of the vegetable world. Decisions have to be made. Guilt has to be swallowed. Bodies have to be buried. It's time to face reality with ruthlessness and a machete. For one thing, let's admit that, lovely as they may have been on the day you bagged them, vegetables don't improve with a nice, long rest in the freezer. And, to be brutally honest, and by this time we might as well, you did pick up veg all winter in the store rather than coming to terms with the freezer. And, to be entirely frank, the family isn't all that keen on veg from the get go, so your effort of resuscitating last year's beans will go unrewarded. So the upshot is that you have invested time and effort into tilling, planting, weeding, harvesting, washing, trimming, blanching, bagging, and freezing, when you could have been napping, swimming, reading, visiting, picnicking, basking and just generally relaxing. But you're in the weeds, I know, so here's a great recipe from fine cooking.com that will give you a new adventure and circumvent the freezer! Just go to their site for a lovely photo and more detail to get you started. Pack the vegetables into clean, hot pint jars. Pour the hot brine over the vegetables, leaving 1/2-inch headspace. Remove any air bubbles by slowly raising and lowering a chopstick or a plastic blade around the inside of the jars (a trapped air bubble may shatter a jar as it heats). 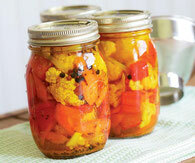 If you have extra brine, strain it and distribute the solids among the jars. Wipe the jars’ lids with a damp cloth before putting on the lids. Secure the lids with screw bands tightened by hand. Process for 10 minutes, following the instructions in their “Canning Basics” guide if you’re a newbie. Store the pickles for at least 2 but preferably 7 days (or longer) before opening. Refrigerate after opening. Winter is long and dark and colourless. It is understandable that when darkness descends by five o'clock, and the garden is buried so deep in snow, it seems that all we can seem to do is reminisce about those glorious, long summer days in the garden. Just remember this: As you perspire over that boiling pickling or blanching pot, your relaxation dreams will be of long, cozy winter evenings, snowed in, by the fire with a good book or good friends and nothing to harvest.